Transits of the inner planets across the face of the sun are relatively rare compared to solar or lunar eclipses. 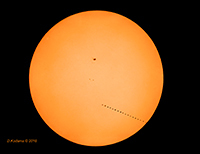 If the orbits of Mercury, Venus, and Earth were in the same plane, each time the inner planets passed us, we would see a transit of the planet across the sun, with Mercury transits seen more often than Venus transits because it orbits the sun faster. However, because the orbits of the inner planets are tilted relative to ours, we see a transit only when the inner planets are crossing our orbital plane. Transits of Venus are especially rare, with pairs of them happening more than a century apart, so they are worth making a special effort to see.